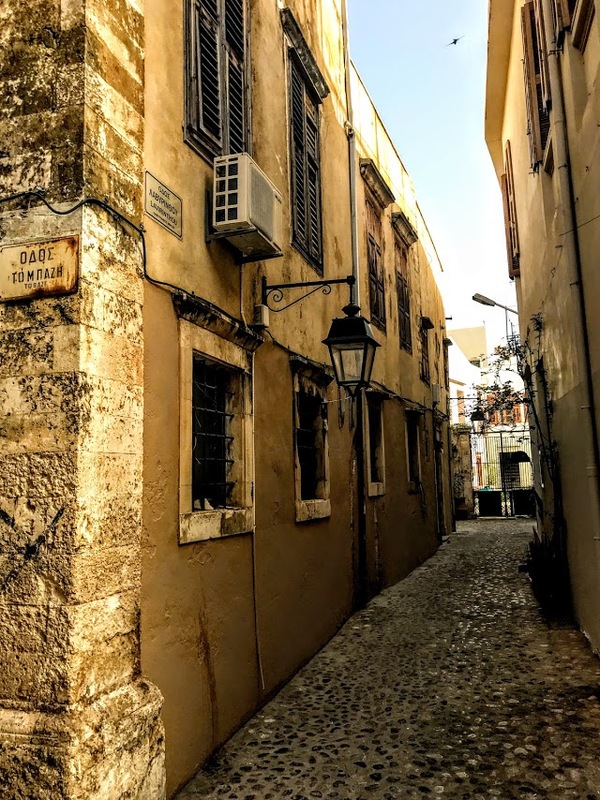 I was back in Rethymnon last night for dinner with some friends, but also spent time in the evening wandering through the narrow streets, visiting churches, sticking my nose into the courtyards of old Venetian palazzi, and enjoying the atmosphere of this old town. 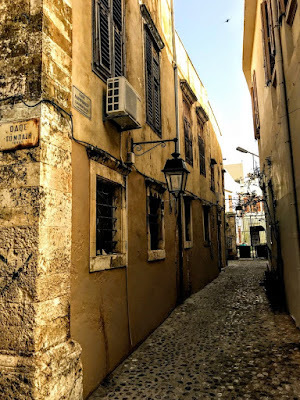 It is easy to get lost wandering through these narrow streets and alleyways, so it is no surprise that one of these streets is actually called ‘Labyrinthos’ (Λαβύρινθος). An unknowing first-time visitor might indeed be very happy with a ball of red string that might help him to find his way back through these streets without getting lost in the old town. Most of the Venetian walls have been lost over the centuries, so that at times it is difficult to tell which streets are Venetian or Ottoman, and where the old town ends and the new town begins. Just outside the Porta Guora, the only surviving Venetian gate of the Old Town, we stepped into the Church of the Four Martyrs (Ιερός Ναός Τεσσάρων Μαρτύρων). 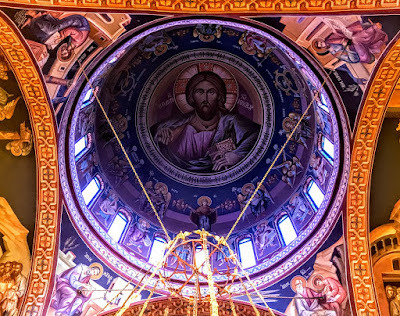 Although it was built in 1975, inside this church has all the appearances of a traditional, Byzantine style church with its dome, apse, and icon screen; the walls are covered with frescoes telling biblical stories and the pillars are decorated with images of saints and martyrs. Two earlier churches on this site were demolished when the present, large three-aisled church was being built. 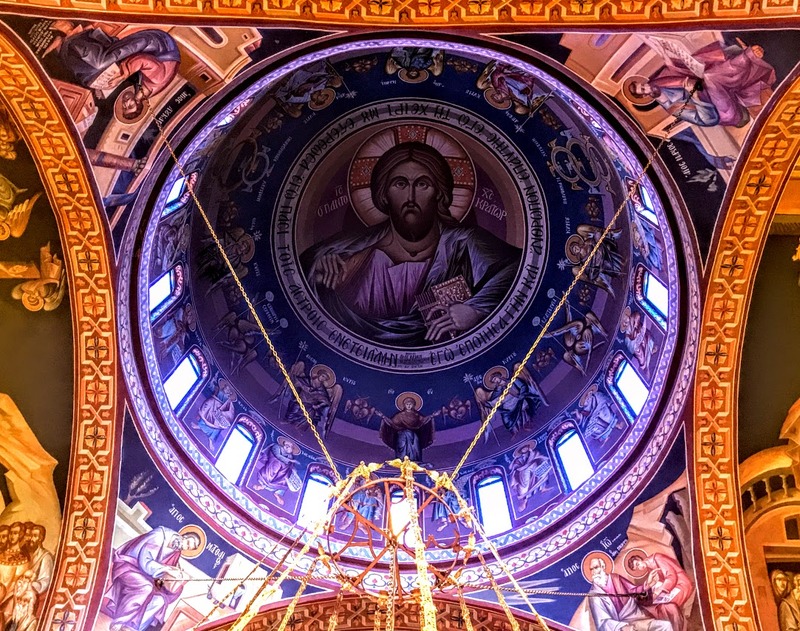 The church is named after four Cretan men, Angelis, Manouil, Georgios and Nikolaos, who refused to convert from Christianity to Islam under the Turks in 1824 and were martyred near the Porta Guora. When Sir Arthur Evans excavated Knossos in the early 20th century, he convinced himself that the Minoan palace had been the Labyrinth of Daedalus. He found many bull motifs, including an image of a man leaping over the horns of a bull. Relying on a passage in the Iliad, he suggested that the palace was the site of a dancing-ground made for Ariadne by Daedalus, where young men and women sent to Crete as prey for the Minotaur would dance together. However, archaeologists have since explored other potential sites of the labyrinth, and they now treat with scepticism the hypothesis that Knossos was the Labyrinth. Labyrinths have often been used in churches and cathedrals as aids to prayer and worship. The earliest known labyrinth in a church is probably a fourth-century pavement at the Basilica of Saint Reparatus, at Orleansville, Algeria, with the words Sancta Eclesia at the centre. The most famous mediaeval labyrinth was created in Chartres Cathedral, and the grand pavement labyrinths in French gothic cathedrals include Chartres, Reims and Amiens. These labyrinths may have been symbolic allusions to the Holy City, with pilgrims praying as they walked through the pathways. These mazes on cathedral floors may have served as substitutes for pilgrimages to Jerusalem, and the cathedral labyrinths are thought have inspired the many turf mazes in England such as that in Saffron Walden. In recent years, there has been a renewed interest in labyrinths and a revival in labyrinth building, and temporary labyrinths have been used in Saint Paul’s Cathedral, London, and Christ Church Cathedral, Dublin, and I know of labyrinth gardens in Saint Fin Barre’s Cathedral, Cork, and Ealing Abbey, London. 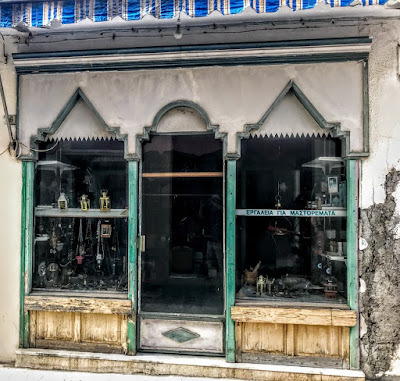 From the Church of the Four Martyrs, we strolled back through the Porta Guora and through the labyrinthine streets of the old town, and four of us had dinner in the gardens of Lemonokipos, a restaurant on Ethnikis Antistaseos facing the square in front of the Neratses Mosque. A newly-married English couple arrived as we were having dinner. Like a modern-day Ariadne and Theseus, they stepped through the tables to applause as the worlds of Byzantine, Venetian and Ottoman Rethymnon met the fashions of the 21st century world of tourism.